The snapper are in spawning mode big-time in Bream Bay, but you have to catch them in the right mood. Spent three days late last week with two Aussie friends who came over here to sample the best our fishing has to offer. They come from Melbourne and fish in Port Phillip Bay where they describe the fishing as 'stuffed'. There was snapper sign everywhere, but it was not until late in the outgoing tide that they rose up from where they had been tucked up hard on the bottom to mid-water where they were doing the wild thing, coming on the bite which proved fast and furious. It was a scenario we saw repeated over the next few days. The first day was spent fishing what is known as the Fingers – off Bream Tail in around 30 metres of water – where we fished a mix of soft-baits, lures and baits. The aim was to better Ivon Ditcham's snapper PB of 7.5kg, caught with me off Miners Head at Great Barrier in 2011, and he rolled this with a 7.93kg fish his first day. It took a 7" Z-man Bruised Banana soft-bait fished on one of the new Shimano JDM Dialuna soft-bait rods I have just added to my armoury. The conditions were pretty stink and the 74-year-old had trouble keeping on his feet, thanks partly to the conditions and the consumption of one too many travel sickness tablets! His other goal was to catch a decent kingfish and while we managed several, none troubled the scorer as they say in cricketing parlance. The next day we fished out of Marsden Cove and while the conditions were a little better, we were confined in close to the popular tarakihi marks just of Bream Head. But it was not turkeys we were chasing, but snapper and kings. The deep foul (52m) produced some nice snapper to five kilos, but the kingfish were not co-operative. The final day, Friday, was Graeme Weaver's turn to shine. Fishing the 'middle ground' on the edge of the Parry Channel in the middle of Bream Bay (40m) we produced a mixed bag of john dory, gurnard, blue cod, snapper and kingfish. Graeme hooked his 10.3kg kingfish on a Shimano slider using an Ocean Angler 'Bender' slow-jig rod. It took him around 25 minutes to boat the fish, which was a good test for the new Black Magic 20lb 'pink' trace I am trialling. It gets the thumbs up from both of us. Looks like the weather is going to close out fishing offshore this weekend. 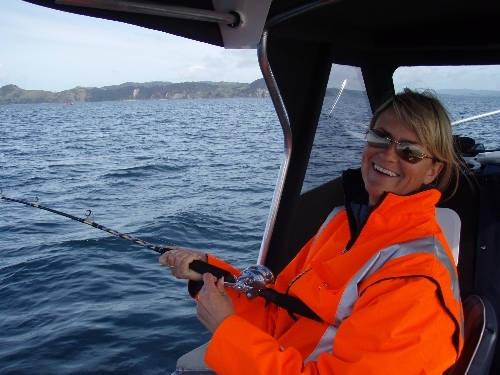 The beach longliners are still getting a feed and those who fish the 'mad mile' at the Whangarei harbour entrance are reporting a few good catches of snapper and trevally, with the odd kingfish turning up around the structures. The scallops are still in great condition and only getting fatter.